the online quilt shop, The Quilting Garden. The Quilting Garden carries a large collection of fabrics from a variety of designers and manufacturers. You know I’m a big fan of Sarah Jane’s Children at Play and the Quilting Garden has one of the best selections available – including that elusive Parade panel. Some of my other favorites include Flower Sugar, Happy Mochi, and Treasures and Tidbits by Robert Kaufman. They also just listed Kate Spain’s newest collection, Good Fortune, along with coordinating Bella Solids. Along with a variety of fabrics, the Quilting Garden also has an impressive selection of quilt kits, patterns, books and notions. They carry the beautiful Cosmo and Cosmo Seasons embroidery thread along with WonderFil’s luscious specialty threads—Konfetti, Spagetti, Tutti and Invisafil. (For more on this cute embroidery go here.) Be sure and check out their Bargain Shed where you are sure to find some great fabrics on sale at 20%, 30% and 40%. There are even fabrics at $4.50/yard! Ronnie at The Quilting Garden is offering a giveaway–a bundle of 9 fat quarters from the beautiful Rhapsody collection from Northcott to one of you readers. First, visit The Quilting Garden, find your favorite item, “Like It” then come back here and leave a comment letting us know what your favorite item is! Second, sign up for their newsletter, then come back here and leave a comment letting me know you signed up. Not only will you be entered into the drawing for the fat quarter bundle, you will also be entered into a drawing for a 1 year subscription to The Quilt Show! Third, just leave a comment here! Here’s the best part: Ronnie is also offering a 15% discount on your entire order, excluding sales items, during the entire month of February. Just use code FEB15 in the discount field during check out. Happy Shopping! My favorite is Batik 517 from Anthology collection! These are beautiful fabrics. Thanks for hosting and thanks to the Quilting Garden for providing a lovely prize. I LOVE THAT LINE OF FABRIC TOO! great giveaway!! Gorgeous fabrics. Thank you so much for this lovely giveaway! i just signed up for the news letter! great place!! Thanks for the give-away chance! i &#39;liked&#39; the cape anne quilt kit. My favorite is the entire Hometown line. I can&#39;t pick just one. I &quot;liked&quot; Astral Summer-Dandelions…..haven&#39;t seen this print before….love it!! I signed up for the newsletter….can&#39;t wait to see more of this site. Love their fabrics! Thanks for a chance. Those are great! I &quot;liked&quot; the little apple layer cake! I agree, lovely fabrics. The greens and blues are gorgeous. Oh, how I love Fat Quarters!! And these are divine!! I Love the FLOWER SUGAR pattern!! I am the newest newsletter member!! I like Elements from Fine Line Fabrics. Thank you for such a wonderful giveaway. » Not So Basic Black And White from Avlyn<br /><br />This set inspired me because I want to do a black and white quilt so bad. I have signed up for the newsletter! Can&#39;t wait to see what is to offer. I am very thankful for the giveaway and know that anyone who receives will be blessed! My favorite is Sweet Divinity fat quarter in Blue which is out of stock of course 🙂 It was very hard to decide because I liked a lot of her stuff! Amy, do you know the name of the book that the ABC embroidery designs came from? I love all the fabrics, especially Sweet Divinity Fat Quarters-Blue! Such a great selection! Love to look at fabric shops! Too much eye candy! But I do like the Sweet Divinity sets and also the Bella Flora Collection. Thanks Quilting Garden for the chance! Cute! Thanks for the opportunity! Beautiful collection! Thanks for the chance! I love your blog and thanks for the giveaway! I love the website, and I signed up for their newsletter. My favorite: Durham-Anew Fat Quarters – Green! What a bunch of lovely fabric. I just love that combination of fabrics. Oh that Children at Play just tugs at my heart. I am seriously considering all four fat quarter sets. :0) What a cute store. Love Love Love the Hometown Reds by Moda. Many cool fabrics–what&#39;s not to love. i just visited their shop, lovely fabrics, thanks for the giveaway. whoops, forgot to mention that I signed up for their newsletter. I like Children at Play On Parade Panel – Multi!!! I subscribed to their newsletter!!! I love your blog and Thank You for the giveaway!!! I like &quot;Daisies and Dots&quot; from Robert Kaufman–the chartreuse floral print. What a fantastic giveaway! Thanks for the opportunity! Thanks for the giveaway–I would love to win some fat quarters to make another baby quilt! I love the Astral Summer collection. Thanks for the giveaway. I new to quilting and I&#39;m loving every minute of it. I signed up for the newsletter – Thanks for the great giveaway! I like that you can purchase most of their sale fabrics in 1/2-yard increments. I like to buy less yardage of more fabrics!! Thanks for hosting this great giveaway!! I love the fabrics that you are offering. What a lovely giveaway. The Quilting Garden is a new shop to me – fun! I am now a newsletter subscribe to the QG. Oh i just love the fabrics, thanks for sharing about the shop! I love the Faith, Hope, Love quilt! I never saw the Long Live Vintage from Adornit line! Im loving the gray color line especially! Particularly the Funky Flowers! Love the &quot;Faith Hope Love&quot; fabric bundle! Wonderful fabric. What a great giveaway. Love the fabrics! So much selection on their site. Thanks for the opportunity. I &quot;liked&quot; children at play bundles<br />and many other itemssssssssss!!!!! I really like the 5450 Hometown FQ – Creams &amp; Yellows set. So pretty! I just signed up for the newletter. Looking forward to some great new and tips! Off to check this store out! Sweet giveaway!! I hope you are having a fabulous day!!! Visited Quilt Garden and my favorite item is the Taffy Quilt. I&#39;m already signed up to get their newsletter. Thanks so much for the giveaway and have a really lovely day! Hello hello! I fell in love with Astral Summer -wow! Thanks for the chance to win – I really enjoy your blog! Oh sorry – forgot to say I signed up the newsletter – Best Wishes! I just signed up for the news letter 🙂 Thanks!! Just subscribed to newsletter. Thanks for the generous giveaway. I liked them on fb, and liked the hometown fabric too. Thanks for the chance at this gorgeous bundle of fabric! Love these fabrics! Thanks for the giveaway. I liked 190 funky flower grey. Great bundle! Thanks for hosting the giveaway! I liked Flower Sugar fat quarter collection. Lovely fabrics, wonderful giveaway, thank you for the chance! Gorgeous fabrics, thanks for the chance to win them! Realmente son unas telas maravillosas! Muchas gracias! I signed up for the newsletter. What lovely fabrics! Thanks – Giveaways are so fun! I signed up for their newsletter, they have a great collection of fabrics! Quilting is so addicting and fun! I just love all the fabric. Pick me please! I just love Kate Spain&#39;s Good Fortune. They have a good selection of other fabrics too. Thanks for the giveaway. So beautiful, I like them all! I really like the Flowers of the Sun collection. And signed up for their newsletter!<br /><br />Thank you! I intended to sew this morning but so far I&#39;ve been reading blogs and enjoying myself throughly. We had a big Superbowl party here last night, all family, 14 of us, with way to much finger food and munchies and I know I should clean (luckily, I did get the dishes done before everyone left), but I am really enjoying browsing. Enjoyed your post and thanks for the giveaway. BEAUTIFUL FABRICS-I SEE A QUILT IN THESE! THANK YOU FOR SHARING! RECEIVING THEIR NEWSLETTER!<br />THANKS FOR SHARING! &#39;LIKE&#39; THE QUILT GARDEN ON FB!<br />I REALLY LOVE &quot;CHILDREN AT PLAY FABRICS&quot;! THANK YOU FOR SHARING! That is a wonderful collection of fabric! I like the Dandelions print in the Astral Summer collection. Beautiful fabrics, so much to do with them! Thanks for the giveaway! Awesome site! I &quot;liked&quot; their Children at Play Navy Bikes – I&#39;ve been eyeing this fabric for a while now! I just joined their newsletter, I love getting newsletters from Quilt Shops, there&#39;s always so much inspiration! And thank you for an awesome giveaway! What beautiful fabrics! Thank you for the chance! Great giveaway! Thanks for the chance to win…. I&#39;ve just started quilting and have just completed my first quilt. Love doing this! It really soothes me and I am enjoying it. I would love to win! Thanks for hosting this great giveaway! I&#39;m with you – I really like the children at play panel! Plus, I &quot;liked&quot; QG on FB. Signed up for the Quilting Garden newsletter. Beautiful fabrics! Thanks for the giveaway!! I like the georgia lou fat quarter bundle. great giveaway. I just started sewing recently, but I can&#39;t afford new fabric. I&#39;d love to win, it&#39;d really help out. Great giveway! I love fabric! I Like Batik Textiles – 1017. The teals and greens are amazing! What a great sight for creativity! I&#39;m inspired! I signed up for the QG newsletter! I like the aqua, pink, and orange daisies from Sweet Flirtations. Thanks for the giveaway! i &#39;like&#39; Hometown FQ – Greys bundle! it&#39;s been a fav for a while now. What a great give away! Love the colors. love this rhapsody bundle … the green butterflies is to die for! One of my favorites is the Designer Houndstooth Fat Quarters! I subscribed to the newsletter! Thanks for the chance to win!! Beautiful Fabric! Thanks for the great giveaway!! I would love to have any of the Quilting Garden&#39;s fabrics, but Good Fortune by Kate Spain is my favorite. Thank you for always hosting such delightful giveaways. The fabrics are beautiful! Nice colors to sew on a cold,cloudy winter&#39;s day. I love the hometown red fq set! That fabric is really nice! I&#39;d love to add to my hoard! Of course I love many of the Good Fortune fabrics, but I looked at the other things they had and chose Doo Dads by Blank Quilting BLA 5937 – Black as my favorite. I&#39;ve signed up for the Quilting Garden newsletter. Thanks for offering this wonderful giveaway. That FQ bundle is beautiful! Leaving a comment and hoping to win!! I love following your blog you always have such lovely posts! Keep up the great work! such beautiful fabrics!<br />thanks for the giveaway! Thanks, I would love to win this! I love the rhapsody collection. Thanks for being a part of the giveaway. I signed up for the newsletter under zephyr_judith. Being a Northcott fanatic I liked the whole collection of Elements by Mark Lipinski. I love the Bella Flora florals and the stripe — such clear, bold colors! I can hardly believe that they are in the Bargain area! I signed up for the newletter too!! I signed up for the newsletter – and clever me, I bookmarked the shop so that I can find my way back! I &#39;liked&#39; the tale of two kitties. I love everything on the site but my favorite item would be the &quot;WHIMSY BEACH KIT&quot;; it is adorable. This is a wonderful giveaway! Thank you. I love the Children at Play line. I would love to win some fabric – can never have enough fabric!! Thanks for the chance to win, I like those butterflies!! I subscribed to newsletter…thanks for telling me! Thanks for give away and turning me onto them!! Thank you for the opportunity to win some beautiful fabric. I love the Batiks from Hoffman. I love the creative-grids-lazy-angle-ruler….that is so nifty! Thanks for sharing another great on line store!!! And forthe giveaway! I have entered SO many giveaways …maybe some day! Thanks for the opportunity! Hope I win! I can always use more fabric! I signed up for the newsletter. Love their stuff!!! Thanks! My favorite collection (at the moment) is &#39;Flowers of the Sun&#39;… gorgeous, sunshiny fabric to welcome spring!! Be blessed. Thanks for the opportunity! This is a great giveaway! I like the puzzle pieces speck grass. I Love their: Flower Power – Pink Large Floral fabric in the bargain shed. I signed up for The quilting Garden Newsletters! What an absolutley ingenious name &#39;The Quilting Garden&#39;, I firmly believe that most quilters are gardeners, I am! My favorite is the cosmo thread looks like I can find the colors I could not find while out shopping the other day! I liked BAM its a neat aboriginal print.<br /><br /><a href="http://richardquilts.blogspot.com&quot; rel="nofollow">http://richardquilts.blogspot.com</a><br />Stop by for my quilt givaway to guess my babys b-day and weight. Signed up for the Newsletter.<br /><br /><a href="http://richardquilts.blogspot.com&quot; rel="nofollow">http://richardquilts.blogspot.com</a><br />Stop by for my quilt givaway to guess my babys b-day and weight. And now just leaving a comment thanks for doing the giveaway.<br /><br /><a href="http://richardquilts.blogspot.com&quot; rel="nofollow">http://richardquilts.blogspot.com</a><br />Stop by for my quilt givaway to guess my babys b-day and weight. I &quot;liked&quot; one of the Good Fortune (I actually LIKE them all! AND…I subscribed to their newsletter…. Love your blog! Thanks for posting the giveaway! I love many of the fabrics but Astral Summer by Paintbrush Studio is really sweet! What a generous giveaway! I already subscribe to the newsletter. Oh my goodness, these are lovely fabrics. Would so love to win this bundle….especially the very colorful one in the middle front! Yummy fabric. I visited the Quilting Garden site and liked this fabric: Rhapsody by Jane Spolar for Northcott 3807-24 Floral with butterflies. So yummy. Tough to choose one item! But I really love the color combo in the Children At Play After School fat quarter bundle. I signed up for the Quilting Garden newsletter. thanks for the great giveaway! Thanks for pointing me in the direction of a new Quilting site…great giveaway. I like the Bali Kaleidoscope Kit. It is gorgeous! Thanks for the chance at your giveaway. I already receive the Quilting Garden newsletter. Love the looks of the embroidery project. gorgeous fabric and awesome giveaway! I love those Good Fortune fabrics, especially 27101-15. Those cherry blossoms are wonderful. What beautiful fabrics, thank you for the chance to win! Thanks for hosting such a cool giveaway! I have not heard of The Quilting Garden yet and had such fun looking around. Thank you! It was hard to pick one, but I &quot;liked&quot; the Flora fat quarter bundle. I&#39;ve subscribed to their newsletter! Just subscribed to their newsletter! Thanks! I&#39;m not on Facebook so I can&#39;t &quot;like&quot; an item, but my favorite is the Hometown FQ bundle in the yellows and creams. Wow, The Quilting Garden has beautiful fabrics! My favorite item on their website is Sentimental Journey from Paintbrush Studio. The colors, the designs, all wonderful. Soooo many options. Among my favorites: Fat n Fabulous pattern, Build a Snowman pattern, Daisy and Dots fabric, Fabric by Moda. I have subscribed to the newsletter. I am still searching the store for one favourite thing. <br />What a lovely shop!! I like the Children at Play line by Michael Miller – they are perfect for my son or daughter. I especially like the hopscotch patterned ones! I &quot;Liked&quot; the Jungle Buzz Collection! So cute and so fun! I signed up for their newsletter! Can&#39;t wait to receive the first one! I enjoy your blog very much! Thank you for sharing your passion with us and, in turn, giving us great inspiration! These look great. Gosh! Fabric has come a long way!!! My favorite is the BOM, Tornado Ally, that is too cute!!! Thanks for the opportunity to win!! I love your blog, I LOVED the &quot;Grammie Quilt&quot;, the colors were awesome and it is always nice to read a story about the person you are making a quilt for!!! Thanks for the inspiration! 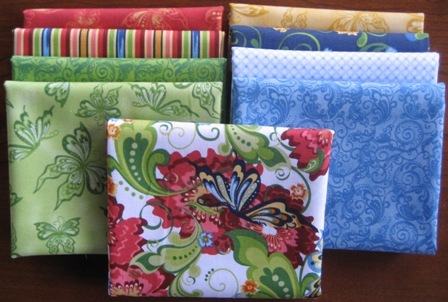 My favorite at the Quilting Garden is the fat quarter bundle, Ellie&#39;s Emporium! So bright and nice to build a stash. I signed up to the Quilting Garden newsletter, after I &quot;liked&quot; the Ellie&#39;s Emporium bundle. I love so many of them! My favorite though is Children At Play… would love to make a variety of things using that fabric! &quot;Liked&quot; the Quilting Garden on Facebook! Thank you so much for hosting this giveaway! Love your blog (and not only for that reason)! Signed up for the newsletter. I love these fabrics!! My niece is expecting a baby this summer. These fabrics will make a perfect quilt for the baby! I am a fan of the quilting garden. I love the bargin bin. Thanks for the giveaway. Love the Daisy and Dot collection on the Quilting Garden. I love the variety of threads – would like to have some of each. I love your giveaway – such beautiful fabric. These are beautiful fabrics! Thanks for the giveaway! I like the Designer Pinwheels From Free Spirit! I love Violet Wishes FQ bundle. I just signed up for the newsletter. Yeah – another place to shop! Gorgeous fabrics!! Thanks for the great giveaway. I love Long Live Vintage from Adornit! the whole line is so nice – love those little dots! Thank you for a chance to win some great fabrics! I signed up for the newsletter from The Quilting Garden. I love the Bella Floral Collection by Paintbrush over at The Quilting Garden; the colors are so bright. I so like black and white and so thought Avlyn Black and Whites were wonderful. My favorite is the Garden Divas From FreeSpirit – I especially like the pastel zinnias. So pretty! Thank you for hosting this giveaway – it would be fun to win this fabric… I was just starting to plan a butterfly-themed quilt for my daughter, so this would be perfect to add to the growing butterfly fabric collection! This is my first visit to your blog and I found this giveaway!! 🙂 Actually, Happy Quilting sent me here as part of the Simply Charmed Blog Hop. That post doesn&#39;t appear, yet; I&#39;ll be back later to check it out. Thanks. My favorite item is the accessory case pattern – they would make great gifts and the shape is fun! I signed up for Quilting Garden&#39;s newsletter! This is the first time on your site – I&#39;m looking forward to great info and inspiration! Gesh, my problem is always picking my favorite color, fabric etc because I love them all!!! But to narrow it down I chose Astral Summer-Dandelions. Very whimsical, which I love. I also loved their site and always know you can learn from others through their newsletters.<br />Great contest and glad I came across it today. I signed up for their newsletter. Thanks for the give away! I always love being introduced to new quilt shops. I loved the Bali Pops….so pretty. Georgeous fabric– I would love to win it! I haven&#39;t used the Good Fortune line yet but have been meaning to. Also your tutorial for today is really cute too, whenever it comes up! I love the Not So Basic Black And White from Avlyn ! The Children at Play panel can be found at the quilt shop &quot;Over the Rainbow&quot;. Good luck. Violet wishes was oh so pretty as were so many other fabrics on that blog. I didn&#39;t find any place to &quot;like it&quot; on that site. Beautiful fabrics! Thank you for the chance to win them! Oh, I just love the Good Fortune by Kate Spain for Moda Fabrics 27100-17 Waterfall. The pattern and colors are delicious! Signed up for their newsletter! So many great fabrics and threads. Thanks for having a giveaway and making things so easy to win! I love the Miss Cutie Patootie kit. Thanks for the giveaway. I love the Rhapsody Fabric. Liked the Flower Power bundle in Blue. Love the giveaway. Thank you so much. Besutiful fabrics. I would love to win!! thank&#39;s for that wonderful giveaway and to share a great fabric dealer! Signed up for the newsletter !! Thank you for the chance to win these wonderful fabrics!!!! I&#39;m signed up for their newsletter! Thank you for the give a ways………I already get their newsletter. That Good Fortune is really pretty – I think that is my favorite! I&#39;ve signed up fot the newsletter! What a fantastic giveaway -I hope I&#39;m lucky! I like the Sweet Flirtations line. Really cute and happy. Thanks for the chance to win the giveaway. I really like those Rhapsody fabrics. I especially love it when they include a stripe in the fabric line. I love the butterflies! can&#39;t wait until spring and warmer weather. I like Good Fortune by Kate Spain. My favorite item (or at least the one I want most ATM!) is the Little Apples layer cake. And thanks for the fab giveaway!! Keeping my fingers crossed! Love Childern at Play – Never seen before. I love the fact that you are giving away these fabs. thanks. I &#39;liked&#39; them on FB and found that one of my favorite fabric collections is Designer Twine. It would make an awesome blender fabric! I signed up for their newsletter and think I will check out the bargain bin–fun stuff! This is a great give-away–I really love these fabrics! Great site! I signed up for the newsletter. I &quot;like&quot; the Terrain fat quarters (so beautiful) and also the &quot;Best Friends&quot; kit in Blue. I like kitties! Thanks for the giveaway! Love the Rhapsody fabric! Thanks for the giveaway. Beautiful fabrics… thanks for the giveaway. I love the category Daisies and Dots. Those two are some of my favorite kinds of prints and I found a bunch I want to get. This is a great giveaway and that is a fantastic new fabric resource for me. Thanks. I really like JS28 Pastel – Spring Wreath such a great design and beautiful Colors. I subscribed to the Quilting Garden Newsletter. Thank you for such a great giveaway. I hope the these beautiful fabrics can be added to my stash. Beautiful fabric! Thanks for hosting the giveaway! I subscribed to The Quilting Garden e-newsletter. Thanks for the chance to win the bundle of Rhapsody. Butterflys and flowers are two of my favorite motifs, and the butterfly is my avatar. It&#39;s not often that you see quality fabrics at reasonable prices anymore! Thanks! I subscribed to the newsletter! What a wonderful giveaway. My favorite is the Hometown FQ bundle in red! i like the &#39;a tale of 2 kitties from red rooster&#39;. so cute. i just signed up for the quilting garden newsletter. My comments are not showing and google doesn&#39;t show them either.<br />I subscribed to The Quilting Garden newsletter. I love exploring fabric, but it is not possible to choose just one. Thanks for a great giveaway. I &quot;liked&quot; their Faith Hope Love Quilt Kit. I signed up for the newsletter. Thanks again. I &quot;Liked&quot; Andromeda Tossed Flower green. I like the selection there, it&#39;s not all the same designers as most shops have. It&#39;s nice to see some different things there. Love the Doo Dads. Black and white is very striking. Thanks for the chance to win! I&#39;ve shopped at The Quilting Garden before and been very satisfied with both the service and quality. I love the Debi Hubbs patterns they sell! Rhapsody is a gorgeous line. Thanks so much for the chance to win some! I like the C6002 Sweet Divinity Fat Quarters-Blue<br />My e-mail is kirafreecuty@gmail.com<br />THanks for the great give away! I LOVE Sarah Jane. I&#39;ve been a fan of hers for some time but had do idea that her prints were made into fabrics. I liked the Children at Play – Playhouse Fat Quarter Bundle! I went and liked some Terrain! AND finally, here&#39;s my comment. As a brand-new quilter, I am so glad to have found your blog. Thanks for sharing all the great information. Love the fabric! Great giveaway! I signed up for the newsletter. My favorite fabric (which I ”liked”) is Michael Miller Children at Play dot to dot in aqua. I think it would make adorable quilt binding. Thank you for the giveaway and for a new place to fulfill my fabric addiction! subscribed to the newsletter, favorite is Avlyn&#39;s Not so basic B&amp;W, &amp; I &quot;liked&quot; them….. I cannot find any of my comments even with a google search. So here goes again. alternate email is mlwright29(at)hotmail(dot)com<br />I signed up for The Quilting Garden newsletter using my google profile address. What a lovely shop! I like the Art Gallery naturals fabric collection! Thanks you for sharing this with us! So fabulous! I liked the C6002 Sweet Divinity Fat Quarters-Blue<br />If I do win my e-mail is kirafreecuty@gmail.com! I am only 11 but I hope to win.<br />Thanks for the contest!!!!!!!!!!! All of these precut pieces sure do making quilting all of our projects fun. Thanks for sharing in the wealth of material. How fun to have new fabric to quilt with. I love all the precuts which make quilting new projects so fast and fun. I have subscribed to the Quilting Garden newsleTter. Thank you for a fabby giveaway. The fabrics look yummy! I like Lecien&#39;s Flower Sugar. The Rhapsody bundle is very pretty. I&#39;m not receiving comment posted confirmation messages and google-ing doesn&#39;t bring up my name on this post.<br />Please pardon if there are duplicate comments. I really do like this bundle which is why I&#39;m persistent. Thanks for the giveaway. Great giveaway, someone&#39;s going to be very happy. I liked them and my fav line is Nature Elements. I love your work! It makes quilting so accessible, even for a beginner like me! I love the Flower Sugar fat quarters! i hope i&#39;m not too late…i&#39;m counting on the fact that i&#39;m on uk time!! eek!